Mexican Chorizo Queso Fundido with Homemade Chips | Mexican Appetizers and More! This Mexican Chorizo Queso Fundido with Homemade Chips is full of flavor and great anytime. Savory chorizo, topped with melted cheeses, more chorizo, scallions, onions and cilantro. 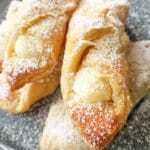 Serve with homemade tortilla chips or store bought. Absolutely delicious!! Oh my goodness! How I love Mexican chorizo queso fundido with homemade chips! I just can’t resist the ooey gooey cheese and the smokey chorizo! I’m sure you will feel the same after you make this awesome dip! 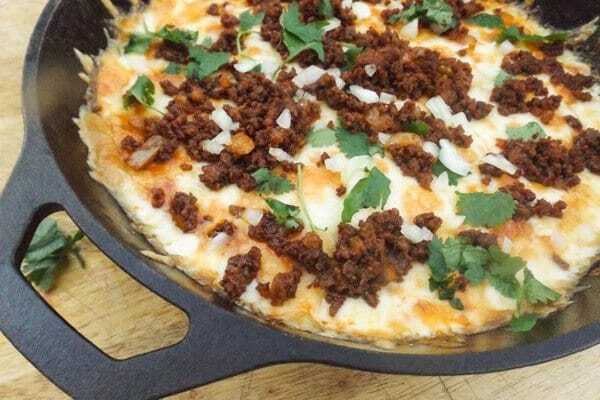 Mexican queso fundido with chorizo is originally made in Mexico with Asadero, Manchego, Menonite and Chihuahua cheeses. Since here in the States, it is a bit harder to find these cheeses, I have chosen cheeses that are readily available to all of us, so we can all enjoy this tasty appetizer. Mozzarella and Monterey Jack cheese. Chorizo in queso is genius! Choriqueso! For one, chorizo is chopped pork and pork fat seasoned with several spices. It can be like a ground pork or in a chorizo sausage casing. Toluca, Mexico is known as the capital of chorizo making, however, they specialize in green chorizo, which is made a little different than the more popular red chorizo. Green chorizo is made with tomatillos, cilantro, garlic and chili peppers. 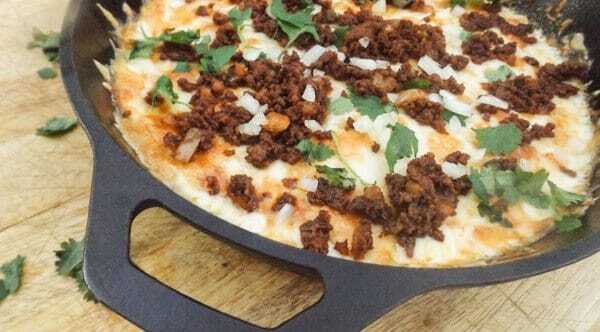 For for this queso fundido with chorizo, we will focus more on the red mexican chorizo. Red chorizo is made with a variety of spices such as ancho chile powder, garlic, smokey paprika, cumin, oregano…just to mention a few. 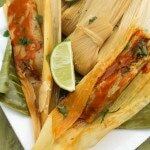 Its intense smokey flavor is just very inviting in many Mexican dishes. 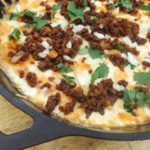 If you have never tasted mexican chorizo before, after you make this dip, I’m sure you will be using it in other ways as well. Friends I believe Mexican chorizo queso fundido with homemade chips is bound to become one of your favorite dips and it may even become addictive! Don’t believe me yet? Go try it. Let me know what you really think! Also try mexican chorizo with some breakfast potatoes and scrambled eggs! Yum!! Remove chorizo from casing and cook in oven proof non stick pan or casserole. I love my cast iron! 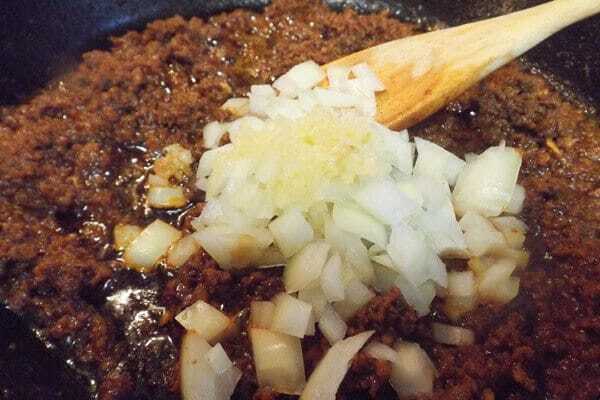 Break chorizo down with spoon or spatula and allow to cook as ground chorizo. Add and cook 3/4 chopped onion and all of the garlic to chorizo. Once cooked, strain chorizo through strainer so as to remove all the extra oil accumulated. Add about 3/4 of chorizo mixture on the bottom of pan and cover completely with cheese. Cook on broil for about 10 minutes until cheese has a nice color. Spread the rest of the chorizo on top, finely chopped onion, scallion and cilantro. This Mexican Chorizo Queso Fundido with Homemade Chips is full of flavor and great anytime. Savory chorizo, topped with melted cheeses, more chorizo, scallions, onions and cilantro. 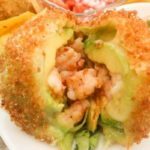 Serve with homemade tortilla chips or store bought. 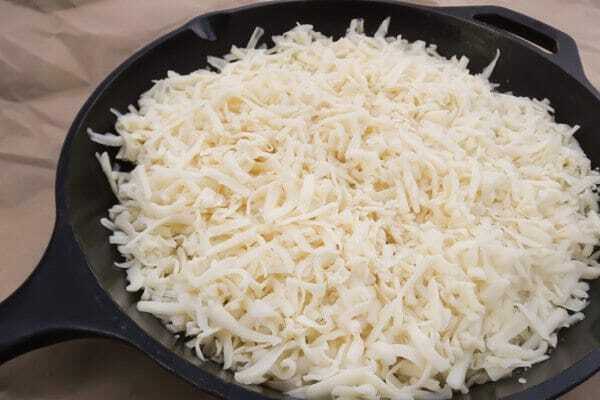 Grate cheeses and mix together with chopped scallions (reserve a little bit of scallions for topping). Set aside. 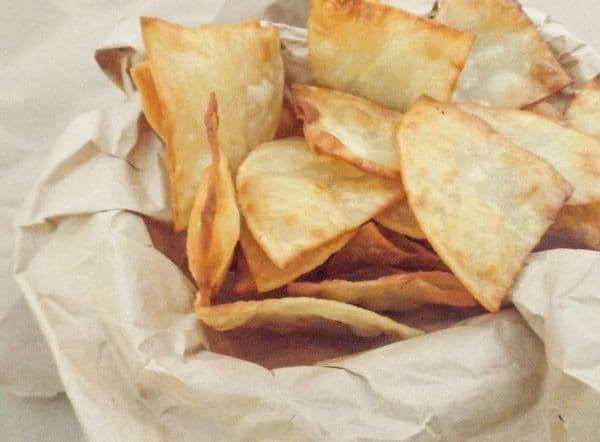 Take a bundle of corn tortillas and cut into quarters to make "tortilla" looking chips. Fry in about two inches of oil until they look somewhat crisp. 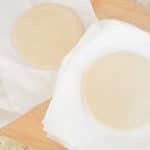 Remove and drain on paper towels. Set aside until ready to use. Alternative: Buy already made tortilla chips. 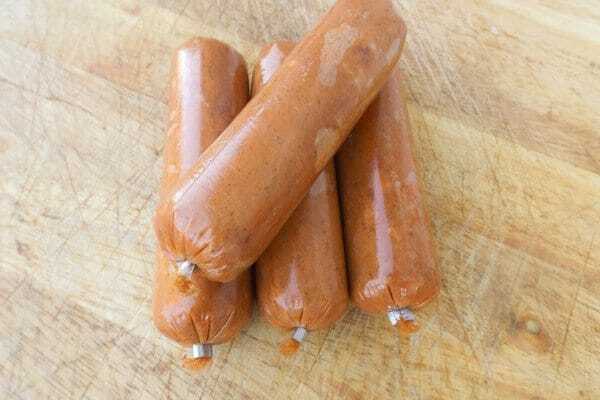 Remove chorizo meat from casing. Using a cast iron skillet or a non stick oven proof pan, break down chorizo with a wooden spoon or spatula. Cook for a 5-7 minutes over medium heat. Add 3/4 of the chopped onion (reserve the rest for topping) and all of the minced garlic. Cook for 5 minutes or until cooked through. 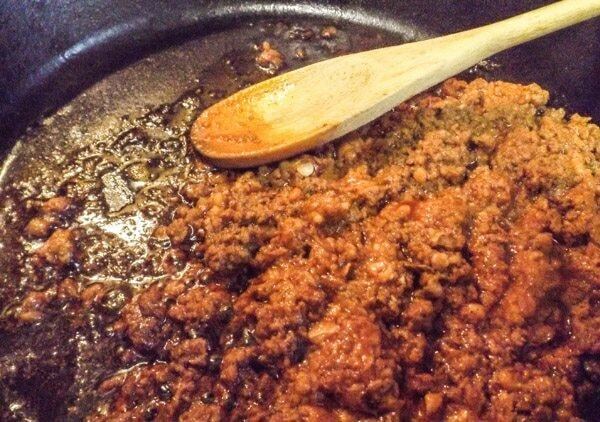 Drain chorizo through a strainer to remove excess oil and set aside. Add about 3/4 of chorizo on bottom of cast iron or casserole. 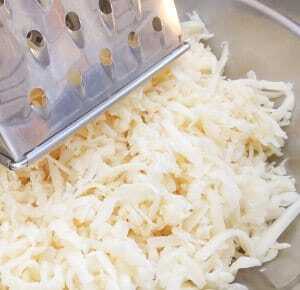 Place the cheese mixture on top. 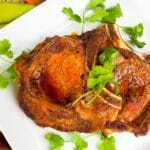 Place in the oven until cheese is melted and is slightly golden brown. Remove from the oven and place the rest of the crumbled chorizo on top of cheese. Garnish with sliced scallions, the rest of the chopped onions and cilantro. Serve with prepared tortilla chips. Note: Serve this dip immediately or the cheese will start to harden. If so, simply add back to oven for a few minutes. Enjoy! Mexican chorizo queso fundido with homemade chips sound yummy to you?